We offer the option of having the makeup artist stay back after she is done, for up to 2 hours for touch-up or hairdo change for the bride during the event. The most ideal time to contact us is 6 - 10 months ahead of your wedding day. Our experienced and versatile make up artists are ever ready to help enhance your beauty for any occasion - especially weddings and company dinners. Our beauty vision is to create a look that does not over power your features, elegant and timeless. A Naturally Beautiful You. We are also versatile in creating other looks such as Glamour or Bold, Themed or In Trend looks that is suitable for you. Only authentic cosmetic products are used. We charge by per face for brides, bridal party and function goers. Day rate will be charged for special projects. In order to confirm your booking with us, a 50% Non-Refundable upfront payment will be required. Once your payment is received, our artist & time slot will be reserved for you. Other interested clients asking the same will be turned away. Any products that are required for the job would have been purchased. Transport/Flight and accommodation would have been booked. Thus, upon client cancellation, the 50% paid will be forfeited to compensate for the aforementioned. Our founder, Veron started her career as a makeup artist in 2007, freelancing on the weekends while she worked a 9-5 job. The Pixie brand name was officially launched in 2009 when the business picks up. 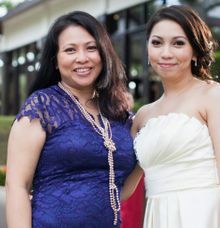 Since then, Veron has been a full time makeup artist, running her company, Pixie Bridal. Based in Kota Damansara, Selangor, the Pixie Bridal Makeup artists have been providing wedding and dinner makeup service to discerning clients around the Klang Valley for more than 8 years. Our experienced and versatile make up artists are ever ready to help enhance your beauty for any occasion - especially weddings and company dinners. Our beauty vision is to create a look that does not over power your features, elegant and timeless. A Naturally Beautiful You. Only authentic products are used.